Menisci are semicircular pieces of cartilage that support your dog's knee joints and absorb the impact of physical activity. Damage to the menisci often occurs alongside torn ligaments or traumatic knee displacement. Meniscal injuries degenerate without treatment, so you should see a veterinary surgeon to discuss your options. The menisci in your dog's knees can be crushed, torn or lacerated to varying degrees depending on the source of the trauma. Minor damage may cause little or no discomfort to your pet at all, but a severe tear can take an entire leg out of action. Since the cartilage is difficult to see with medical scans, your dog's surgeon must investigate the knee joint directly to assess the meniscal injury. He may make a single incision to open the joint or create several small incisions to examine the meniscus with a tiny camera. The primary method of treating meniscal injuries is through a surgical procedure to remove damaged tissue. 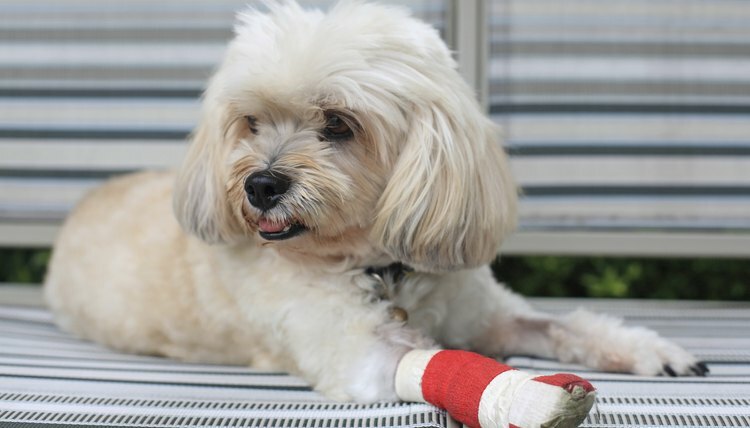 Depending on the extent of your pet's injury, the surgeon may opt to perform either a total or partial meniscectomy. In either case, the objective of the operation is to cut out all of the damaged cartilage inside your dog's knee. While your vet must take care to remove all of the injured tissue to prevent future problems, he may attempt to leave as much healthy tissue as possible to maintain the joint's function. While tears in your dog's menisci can only be treated through surgery, other types of damage may benefit from medical rehabilitation and observation. Lesions and minor damage to the cartilage resulting from irregular bone movement can be improved by stabilizing the joint. Physical therapy may include regimented exercise, changes in diet, massages and other chiropractic treatments, according to Dr. Julie Mayer on the Integrative Veterinary Care Journal website. Rehabilitation efforts may include electromagnetic pulse and shock wave treatments as well as laser and ultrasound therapy. While a meniscectomy is the only way to treat severely damaged cartilage, it is not a perfect solution. Surgery patients are at high risk of developing chronic arthritis following the operation. However, recent developments in stem cell therapy offer pups and their owners a way to combat this problem. An injection of stem cells into the knee a few weeks following surgery allows for the partial regeneration of lost cartilage, although owners should not expect a full recovery. There are few risks associated with this therapy, although owners should expect to pay $1,500 or more for the injection and related care, according to Colorado State University Veterinary Teaching Hospital website.